The theory that happiness is relative is based on three postulates: (1) happiness results from comparison, (2) standards of comparison adjust, (3) standards of comparison are arbitrary constructs. 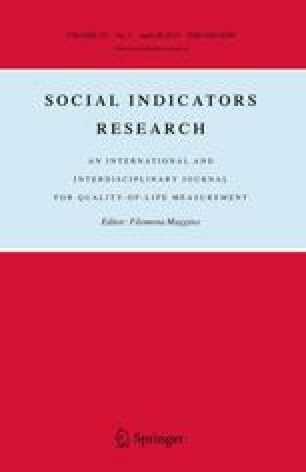 On the basis of these postulates the theory predicts: (a) happiness does not depend on real quality of life, (b) changes in living-conditions to the good or the bad have only a shortlived effect on happiness, (c) people are happier after hard times, (d) people are typically neutral about their life. Together these inferences imply that happiness is both an evasive and an inconsequential matter, which is at odds with corebeliefs in present-day welfare society. Recent investigations on happiness (in the sense of life-satisfaction) claim support for this old theory. Happiness is reported to be as high in poor countries as it is in rich countries (Easterlin), no less among paralyzed accident victims than it is among lottery winners (Brickman) and unrelated to stable livingconditions (Inglehart and Rabier). These sensational claims are inspected but found to be untrue. It is shown that: (a) people tend to be unhappy under adverse conditions such as poverty, war and isolation, (b) improvement or deterioration of at least some conditions does effect happiness lastingly, (c) earlier hardship does not favour later happiness, (d) people are typically positive about their life rather than neutral. It is argued that the theory happiness-is-relative mixes up ‘overall happiness’ with contentment’. Contentment is indeed largely a matter of comparing life-as-it-is to standards of how-life-should-be. Yet overall hapiness does not entirely depend on comparison. The overall evaluation of life depends also on how one feels affectively and hedonic level of affect draws on its turn on the gratification of basic bio-psychological needs. Contrary to acquired ‘standards’ of comparison these innate ‘needs’ do not adjust to any and all conditions: they mark in fact the limits of human adaptability. To the extend that it depends on need-gratification, happiness is not relative. An earlier version of this paper was presented at the International Conference of Psychology in Sydney, Australia, September 1988.